Pathfinders is a worldwide organization of young people sponsored by the Seventh-day Adventist Church. This is an opportunity for youth to learn and grow in a fun, positive environment, learning outdoor skills, citizenship skills, and social skills. Grants Pass Church is happy to offer an exciting, scouts-like program that allows children ages 10 and up to learn practical outdoor skills, teamwork, self-confidence, and how to apply the things we learn in church about our fascinating, loving Creator. 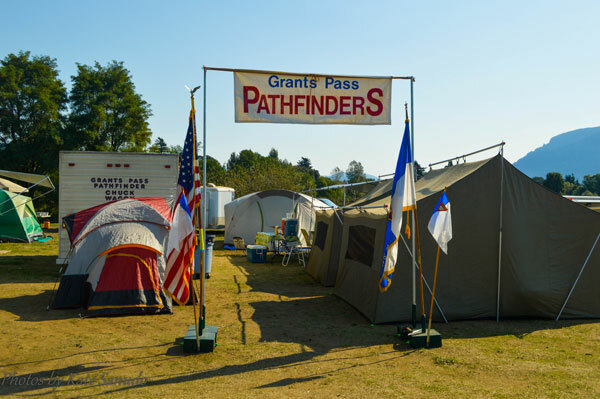 Led by Director Eric Wagner and Deputy Director Melissa Derfler, the Grants Pass Church’s Pathfinder team exists to offer kids a weekly dose of enjoyable, constructive activities that also help give them a sense of belonging to their church. They love seeing the smiles of fascination and accomplishment on the kids’ faces, and have been moved at the amount of growth they see as the kids go through the program year after year. Overall, this Pathfinder team demonstrates how serious Grants Pass Church regards our children and their future. Equipping them with life skills and a foundation for developing their individual strengths will help them take ownership in their spirituality and bless others as they grow. Sound like a great opportunity for you or your child? We are always looking for new Pathfinders as well as qualified, dedicated, leaders. Your influence can guide a child in self-confidence and a saving relationship with Jesus Christ! Contact Eric today to join in on these life-enriching activities!